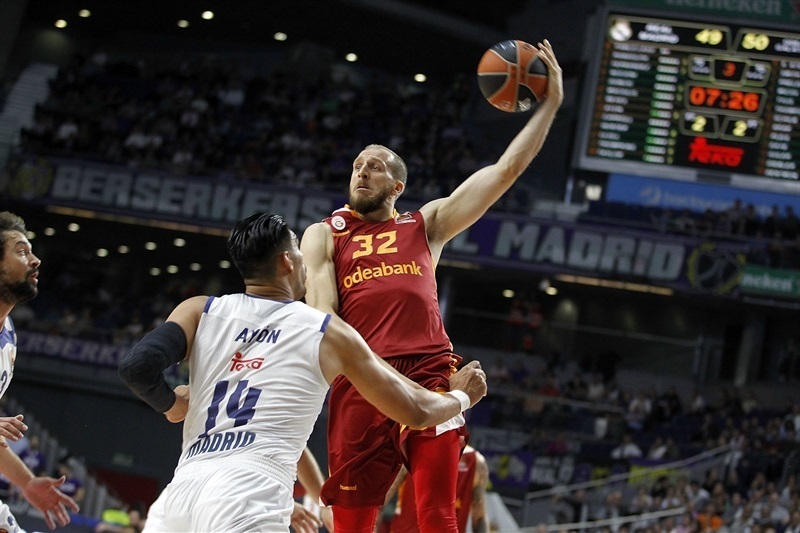 Real Madrid defeated Galatasaray Odeabank Istanbul 90-81 in the Spanish capital on Thursday to improve to 4-1 in the regular season, while keeping Galatasaray winless. Sergio Llull led the winners with 23 points. 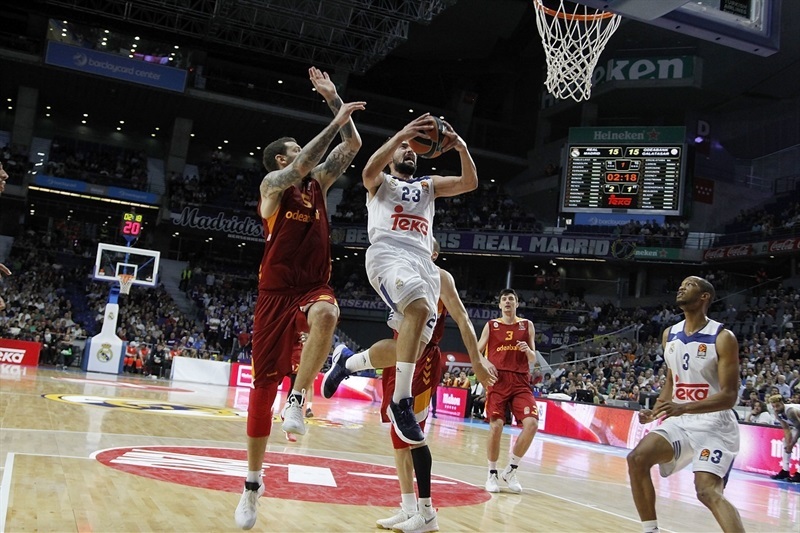 Rudy Fernandez added 13 points and 6 assists, Luka Doncic scored 11, Gustavo Ayon had 10 before fouling out and Anthony Randolph pulled down 10 rebounds for Madrid. 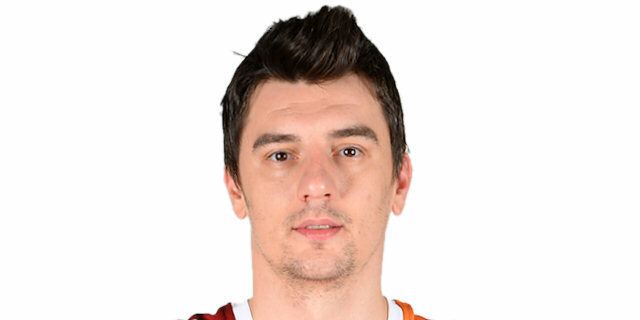 Vladimir Micov led Galatasaray with 17 points, but only 3 of those came after the break. Alex Tyus added 14 on 7-of-9 shooting, while Emir Preldzic scored 10 for the guests. 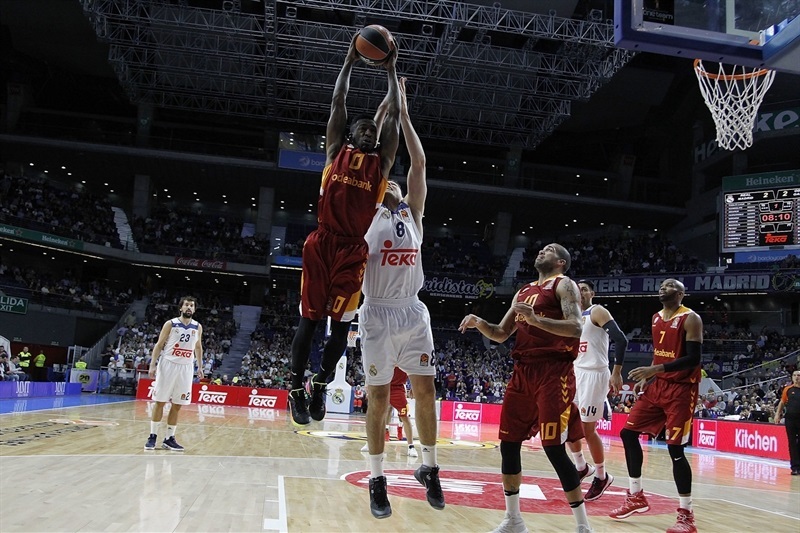 Madrid outrebounded Galatasaray 37-26 and hit 25-of-40 two-point shots (62.5%) in the game. Madrid made just 2-of-8 three-point shots before halftime, but 8-of-18 (44.4%) after the break, which made the difference in the game. Ayon and Randolph fueled an early 7-0 run that Llull capped with a coast-to-coast layup for an 11-6 Madrid lead. 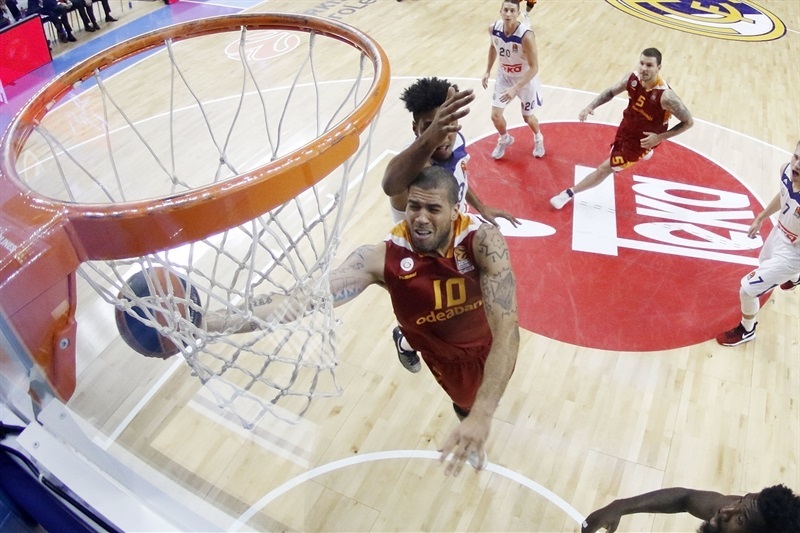 Blake Schilb hit a triple and Micov struck twice from downtown to put Galatasaray back in charge, 11-15. Ayon and Randolph kept pacing Madrid, but back-to-back baskets by Sinan Guler and another three-pointer by Micov kept the guests ahead, 19-22, after 10 minutes. Micov and Justin Dentmon boosted Galatasaray's lead to 25-30 early in the second quarter. 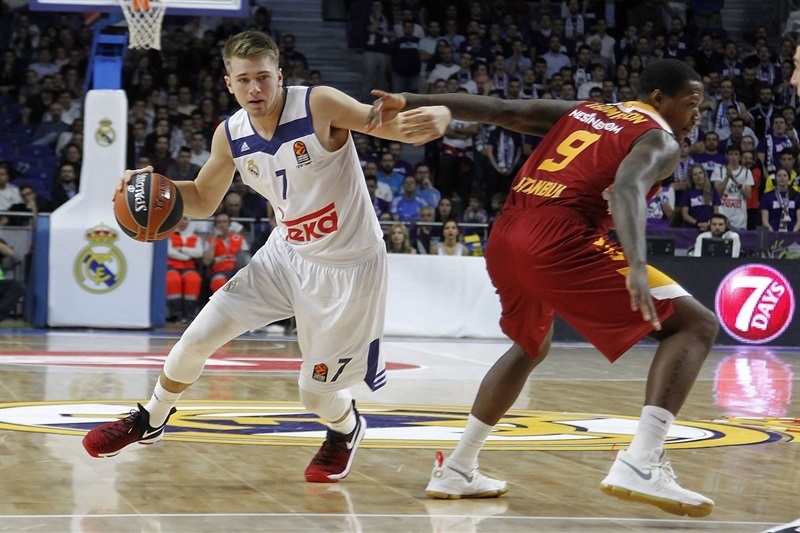 Doncic hit a triple, but Deon Thompson and Jon Diebler made it a 7-point game. 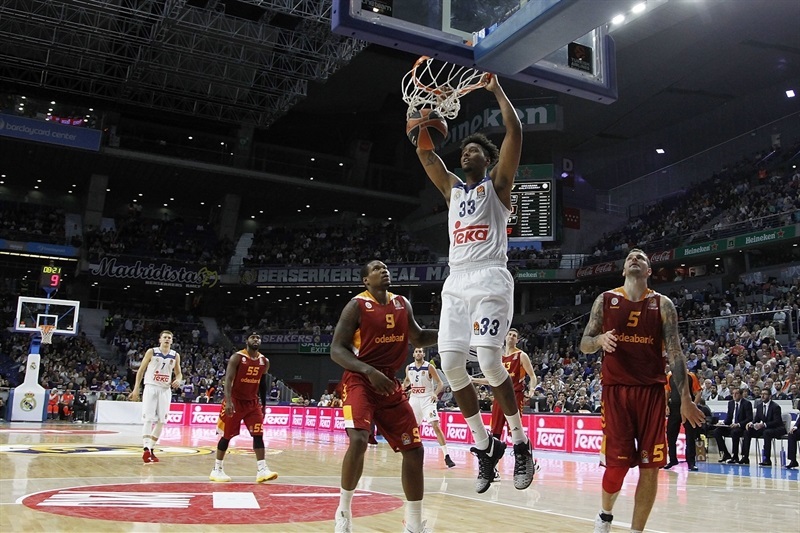 Trey Thompkins and Jeffery Taylor stepped up for Madrid and a big dunk by Doncic brought the hosts within 39-41. A tip-in by Tyus and back-to-back layups by Schilb kept Galatasaray ahead, 45-47, at halftime. Tyus and Preldzic boosted the guests' lead to 49-53 soon after the break. 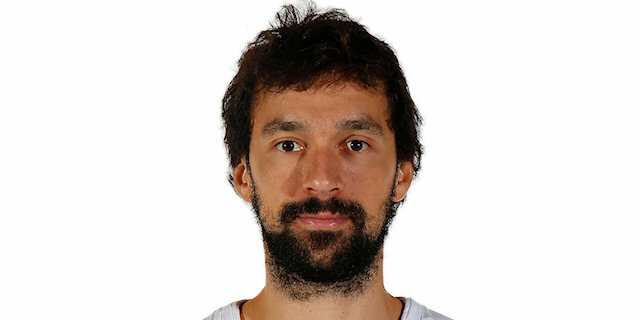 Madrid found its regular go-to guy in Llull, who hit a fade-away jumper and went on to down a trio of three-pointers for a 66-64 Madrid lead after 30 minutes. Fernandez buried back-to-back threes in transition, which caused Galatasaray to call timeout at 72-66 with seven minutes left. 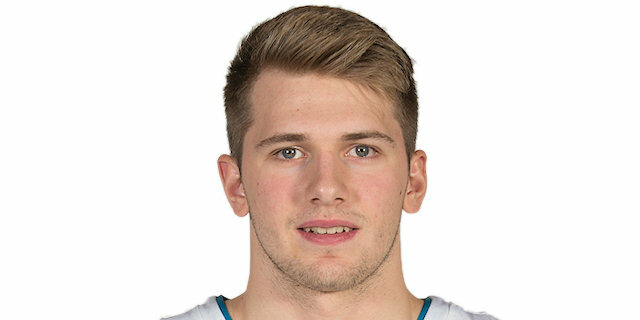 Doncic followed a layup with a dunk and Jaycee Carroll struck from downtown, but Dentmon and Guler kept Galatasaray within 79-75 with four minutes to go. 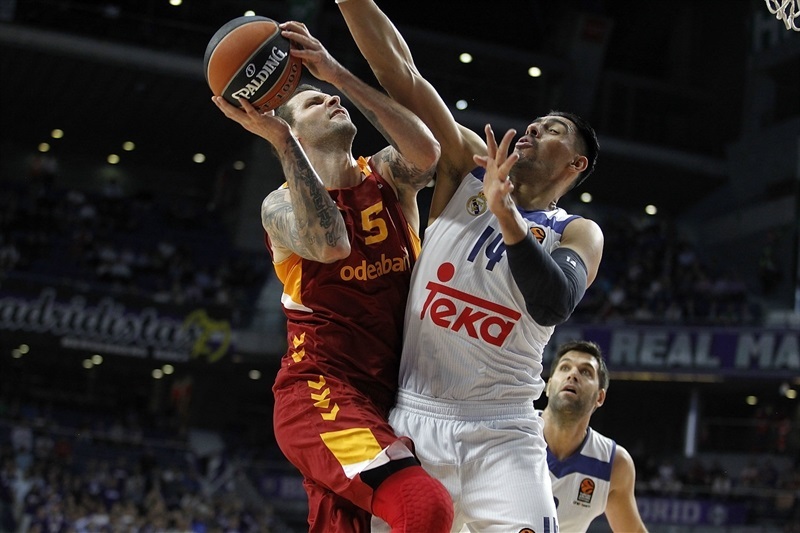 Galatasaray did not give up, but a floater by Felipe Reyes and a layup by Randolph sealed the outcome, 85-79, in the next-to-last minute. Both teams will play in Round 6 action next Friday. 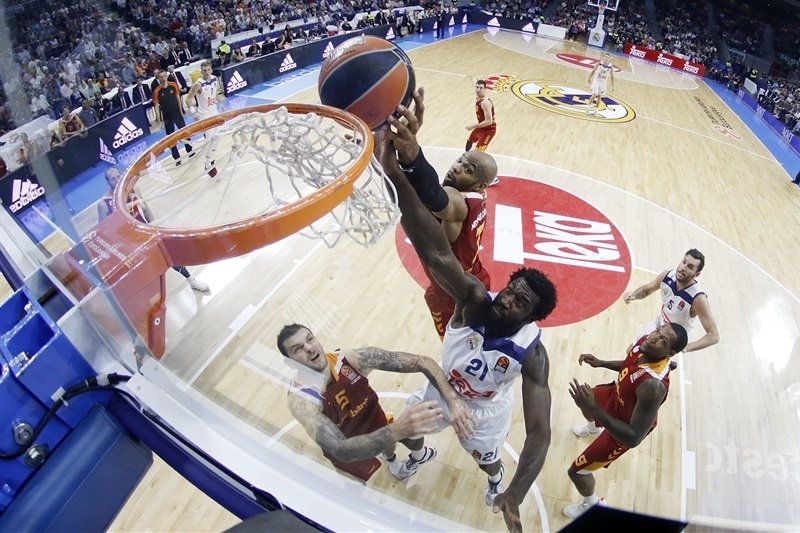 Madrid visits the Russian capital to face CSKA Moscow, while Galatasaray hosts Olympiacos Piraeus. "First of all, congratulations to my team for the win. The game has two different readings. A good one, which is that I believe that we were able to win a game that we didn't have control over it, being able to find our opportunities. I believe they knew how they wanted to play, opening the floor, not letting us play at our pace and they succeeded at that. The teams' index were 109 to 72, so we did a lot of good things in order to win. I am optimistic and take the good reading of the game. We didn't play smoothly tonight and it was hard for us to play one-on-one or move the ball well, but found our way to get the lead and win, which is always difficult in the EuroLeague. We have to learn from this game, but I am happy we won." "I think that we played a good game tonight. We took control of the game until the last 2-3 minutes. We played good halfcourt defense and didn't allow easy baskets in Madrid's set offense, but we made mistakes, turnovers on offense, missed layups in the final minutes and allowed fast break, open three-point shots, especially from Rudy Fernandez. We lost the game, but I think it was one of our best games in the EuroLeague this season. It is not easy, especially for our players from last year. They are a winning team and proved it in the EuroCup. We lost every game, but played against CSKA, Fenerbahce, Maccabi and Real Madrid. All of these games are not easy for us, a new team in the EuroLeague. We also lost against Crvena Zvezda in the last seconds. I am optimistic for the future because now, we will play against teams of our level. Finally, we are not in the EuroLeague to win it, but to try to make it to the playoffs. I am also positive; I think we can reach 12 or 13 wins and make it to the playoffs. All of these games until now other than Zvezda, it was not a surprise that we lost. We were close to winning tonight and recovering from the Zvezda loss, but we didn't. It is a long EuroLeague and we only played five games. We still have 25 games and many opportunities to win." "I think that all EuroLeague games are tough, at home or on the road. We lost our last home game against Baskonia and I think we played a good game tonight. We could have done better, for sure, but we are happy with this victory. Galatasaray is at the bottom of the standings, but competed for every win and played against great teams like Fenerbahce and CSKA. They have a very good team with many good scorers, like they proved tonight. We still have room for improvement, but winning was the most important think tonight so we are happy. We have to be strong at home and already lost one against Baskonia and we had to win tonight no matter what." 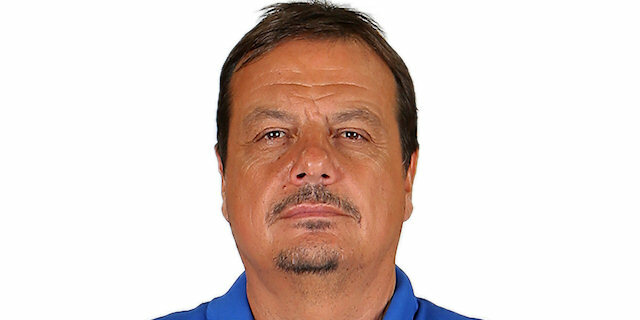 "We had to work hard for this win because Galatasaray is a tough team with many good players. We played good defense in the second half and managed to pull it off. This win gives us a lot of confidence because they really needed it. We have a tough week ahead of us against two very good teams - Barcelona in the Spanish League and CSKA in the EuroLeague. I feel comfortable in Madrid and hope to stay here for a long time." "We played a very good game for, like, three and a half quarters, but we made three or four turnovers in the last five minutes and they scored in the fast break. That cost us the game. We need to keep practicing hard; we are playing better and tonight, we showed we can compete against everybody. We need to be focused for 40 minutes, then I think we will have great chances to win games."